HoloBuilder now allows for collaboration: Edit your projects with multiple users and enjoy improved permissions handling for the whole team. Moreover, the new HoloBuilder supports some additional features which will help you and your team work even more efficiently. To get started, visit our pricing page. By subscribing to HoloBuilder, you will be enabled to manage multiple projects and collaborators and build your projects with the whole team. Find some frequently asked questions (FAQs) at the bottom of the page. Pricing for HoloBuilder is based on the area of your projects in square feet (sq ft). In order to create new projects, you purchase an annual allowance of square feet for the area of all of your projects for which you want a license to use HoloBuilder. You can get purchase a subscription and find out more about pricing from our pricing page or contact us at buildingtogether@holobuilder.com to get more information. The purchased sq ft can be used anytime to create a new collaborative project with HoloBuilder. Depending on the overall size of the project site you want to document, the corresponding number of sq ft will be subtracted from the total amount you purchased. There is no billing per agent—the billing is only related to the total sq ft of your projects in HoloBuilder. If you have any further questions, please write us at buildingtogether@holobuilder.com. Before you decide on anything, you can trial HoloBuilder for 21 days. Within this trial period, all features in HoloBuilder can be tested among your team to help you better understand the benefits that HoloBuilder brings to your company. The number of trial projects is not restricted during the trial and can be created independently of the number of sq ft. Please note, that you purchase sufficient sq ft when subscribing to HoloBuilder when the trial ends or delete unnecessary projects to reduce the number of used sq ft accordingly. If you already have an old paid subscription and do not upgrade to the collaboration plan, please be aware that all collaborative projects will become inaccessible for any invited editors for editing. You will return to your previous plan with the corresponding feature set as you are used to. If you have any questions regarding the trial or if you would like to get started now, please feel free to contact us at buildingtogether@holobuilder.com. When subscribing to HoloBuilder, it is possible to either start a completely new project to collaborate with any team members from the beginning or convert one of your existing projects to a Team project and continue your work collaboratively. To create a new project that has access to all of the new collaboration features, open the web editor or click ‘ File’>’New’ if already in the editor. 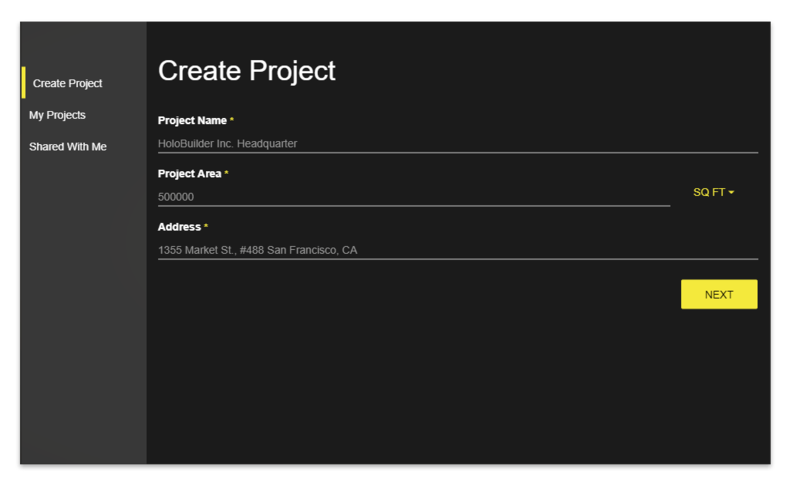 Enter the project name, the number of square feet your project has and the address. You can now start working on your project, invite additional editors or continue your project in the JobWalk app. Please make sure to purchase sufficient sq ft beforehand to avoid any problems. If you already had a subscription before and would like to continue working on an existing project of yours, we offer the ability to upgrade your projects to have access to all of the new features of HoloBuilder. Open the ‘My Projects’ list and click ‘UPGRADE PROJECTS’. From the list, select the project you want to upgrade. Note that any collaborative projects are already marked with . Or, select the project directly from the projects list. When asked, click ‘UPGRADE PROJECT’ to convert the project. Enter the project area as well as the project address and click ‘NEXT’ to proceed. You can now invite collaborators to view or edit the project. HoloBuilder projects can be collaboratively edited within the JobWalk app as well as the web editor. All changes will be synchronized with the cloud version when saved. This online version can be accessed from different devices and accounts simultaneously to be edited. There is no limitation on the number of collaborators editing a project at the same time through the app or the web editor. The web editor allows you to create, edit, and view projects in the cloud. All collaborators with editing rights can access the project simultaneously in the web editor and use any of the provided features to work on a project. All HoloBuilder projects can be accessed in the browsing overview. The browsing overview will show when first logging into HoloBuilder or can be opened in the drop-down menu ‘ File’>’Browse’. Projects created by you can be found in the tab My Projects, projects shared by somebody else are found under the tab Shared With Me. It is only possible to delete a project you created yourself. Please note that if you delete a HoloBuilder project, the project will be removed completely for all collaborators. If you need help recovering a deleted project, please write us at support@holobuilder.com. Projects shared with you by somebody else cannot be deleted by you and will stay in your Shared With Me project list until the owner of the project deletes this project or removes you as a collaborator. Collaborators can be added, changed or removed in the Permissions tab of the Project Properties. Open the Project Properties by clicking on the name of the project at the top of the editor. Please note that only the owner of a HoloBuilder project has access to the Project Properties and can edit the collaborators. To collaborate in a project, the invited collaborator needs to have a HoloBuilder account with the given email address. The account can be both, inactive or have a paid subscription of its own. The accounts subscription is independent of the HoloBuilder project the collaborator is invited to. Any invited collaborator, which does not yet have a HoloBuilder account, will be asked to create an account with the corresponding email address. If no account is created, the invited collaborator cannot access the shared project within the web editor. New collaborators can be added by entering the corresponding email address in the Permissions tab of the Project Properties. Select the desired permission role from the drop-down menu ‘Choose role‘ and press ‘INVITE’ to send the invitation to the added email address. The new collaborator will appear in the list above with the given role. Any invited collaborator that already has a HoloBuilder account will receive an email with a link to the corresponding project in player view. When logging into the editor, they can access all shared projects directly from the Shared with me project list. Collaborators that do not yet have a HoloBuilder account with the given email address will be marked with a little envelope until they create a HoloBuilder account with said email address. Without a HoloBuilder account, the collaborator can only access the project to view with the given share link. To get an overview of all shared projects as well as editing possibility, please have the collaborators sign up with the corresponding email address. The collaborators of a HoloBuilder project can have three different roles: owner, editor, and viewer. Each role has predefined permissions included restricting the corresponding collaborator to a given set of actions and access rights. The owner role includes the permissions of all subordinate roles. The owner is the creator of a HoloBuilder project and does not have any restrictions regarding editing this project. In addition to editing and viewing a project, the owner can also invite new or manage existing collaborators, change the project properties, and delete the project. A HoloBuilder project can only have one owner. A collaborator can be an editor, having editing as well as viewing permissions. Editors can add and change sheets, scenes, time travels as well as use any other editorial features to edit the content of a HoloBuilder project. Changes can be made within the web editor or using the JobWalk app. An editor cannot invite additional collaborators to the project or change the project properties. Collaborators with view-only permissions can only view a shared project in the player with the corresponding share link. 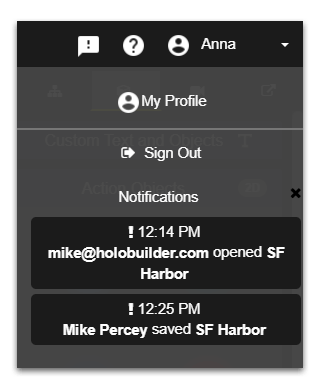 They can sign into the HoloBuilder web editor to access a list of all the projects shared with them and open them directly in the player view in their browser. A viewer cannot access the editor view and is not allowed to make changes to the HoloBuilder project. Any invited users can be denied further access to the project by removing them from the permissions list. Click on the little recycling bin next to the collaborator you want to deny access to the project and confirm. It is only possible to remove collaborators with viewing and editing rights, not the owner. Please note that if you delete a collaborator, he or she will lose immediate access to the project and cannot continue to view or edit the project. To change the permissions or email address of a collaborator, you first need to delete the collaborator as described above. Add the collaborator again with the corresponding role and email address. When a collaborator opens a project in edit mode or saves a project, all collaborators currently editing the project receive a notification in the web editor. The notification will pop up in the lower left corner and a notification history can be viewed when clicking the account name marked with an exclamation mark. In the drop-down, you will find any information about collaborators opening and saving the project you are currently working on. All editors can work with Time Travel, Multiple Sheets as well as the JobWalk app. The JobWalk app supports any collaborative editing of a new HoloBuilder project increasing the flexibility and efficiency. A project can be edited simultaneously by multiple editors with adding sheets, scenes or time travels, even when working, e.g., on the same sheet. Sheets can be virtually separated into different areas to be covered simultaneously when capturing new scenes with multiple job walks. Find out more about how the JobWalk app works here. Each editor can then synchronize his or her progress to be uploaded and merged with the other versions as well as the web version. Any collaborator of a HoloBuilder project has at least view permissions and is allowed to view the corresponding project in the browser. Accessing a shared HoloBuilder project can be done through the link provided in the invite email, by logging into the web editor or with any other provided share link to the project. When first receiving the invite to a collaborative project by email, you will have a link within this email to open the project directly in the player view. Collaborators with only view permissions can open the project in the browser but not enter editing mode. Invited editors can access the project in editing mode, if logged in, by clicking the ‘Edit’ button in the player view. Same holds for any other basic or advanced share link you may receive by email etc. An overview of all shared projects can be accessed when logging into the web editor. Select a project for which you have Viewer or Editor permissions in the project list under the Shared With Me tab to open the project in a new browser tab. You can access a project in the Shared With Me tab to view your project at any time. Archive your projects from your ‘My projects’ list. Archived projects can be downloaded to be stored, viewed and shared offline. Learn more about archiving and downloading your projects here. Please note that archived projects cannot be edited anymore and need to be unarchived to add changes. Also, a project can only be downloaded once a year. Once a project was downloaded, it cannot be edited anymore at all. Please let us know if you still have any remaining questions regarding our new features and collaborative projects and feel free to contact us to acquire further information on this or any other topic. We are happy to help. Write us at support@holobuilder.com. This entry was posted in HoloBuilder Tutorials, What's new? and tagged 360°, archive, collaboration, construction, new, new features, offline, team, team work, Tutorial, virtual reality. Bookmark the permalink.